We are thrilled to giveaway a few copies of Emily Ley's new book, A Simplified Life! To enter the giveaway, CLICK HERE. Last week, Emmy – nominated producer, strategist and course creator Andrea Corson mapped out exactly how to Create, Market and Monetize Video Content. 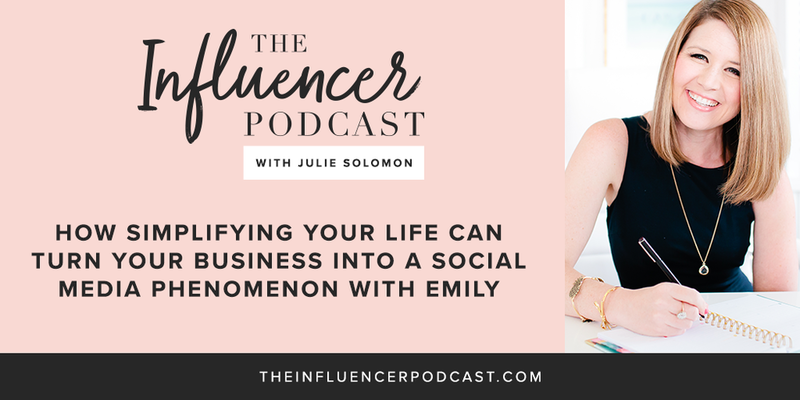 This week, best-selling author, entrepreneur, wife and mom Emily Ley shares how leading a simplified life turned her business into a social media phenomenon, and gives us tactical tools to completely renew our brand and life, too! Today’s guest is super special to me, because she is someone I have gotten to know well over the past year. I’ve had the honor and privilege to be handling book publicity for her upcoming book, A Simplified Life, that is releasing next Tuesday nationwide. I am of course talking about the incredible Emily Ley. Emily is Founder and Creative Director of Emily Ley Paper & Gifts. She is also the creator of the bestselling Simplified Planner -a daily agenda for what matters most. Emily has made a huge impact through her wildly popular Simplified Planner and with her first book, Grace, Not Perfection. With more than 80,000 copies of her first book sold in the first two months, Emily has become a trusted resource and lifestyle guru as well as a social media darling. You can’t help but to soak up her amazing content on instagram! Building on her proven branding and message, as well as on the structure and simplicity readers get from the Simplified Planner, her new book A Simplified Life offers expanded tools, tips, resources, and inspiration for nearly every area of a woman's life. This book will go deeper with tools to help readers plan and simplify and meets a huge felt need among consumers as they look for ways to prioritize. Emily has been recognized with numerous awards, including Best New Product-Desktop (for the 2015 Simplified Planner®) as well as Top 10 Designers to Watch in 2015 by Stationery Trends Magazine. Now as a businesswoman, wife, and mama to three, Emily enjoys Friday pizza parties on the living room floor, strong cappuccinos with her college-crush-turned-husband, and making memories to savor for a lifetime with her twins and preschooler. It’s been a honor to work with her this year, and an honor to have her on the show today!